With so many adventures onboard — from glow-in-the-dark laser tag to the tallest slide at sea — it's no wonder TIME magazine named Symphony one of the World’s Greatest Places! As the new sound of adventure, Symphony hits plenty of high notes with guests, and that starts even before they’re on board. Its new home, Terminal A, is now the largest cruise terminal in the U.S., and this state-of-the-art, LEED-certified facility uses new technologies to create a seamless experience from the moment you arrive. 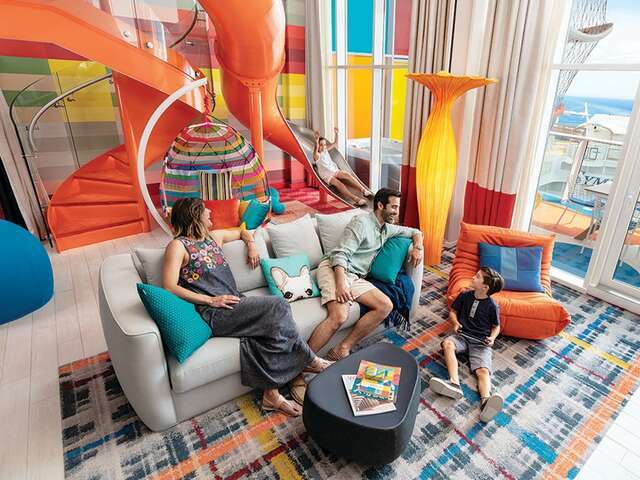 One of the most jaw-dropping new offerings is the multistory Ultimate Family Suite, which rolls out the red carpet (quite literally) for the kid in all of us. A slide connects the vibrantly colored kid’s room to the living room, where an air hockey table and an interactive building block wall await. In a private cinema room with an 85-inch 4K Ultra HD TV, everyone can enjoy movies and popcorn or play one of many video games on the latest consoles. The suite’s balcony is just as impressive, with table tennis—that also doubles as a dining table, the Luckey Climber vertical maze for the kids, a full-sized whirlpool and sun loungers. As the new world’s largest cruise ship, there are a variety of staterooms to fit every need from rooms overlooking the water, the leafy Central Park and seaside-inspired Boardwalk neighborhood. For exciting new meals, head to the brand new Hooked Seafood restaurant, which offers a great casual setting and expansive ocean views. 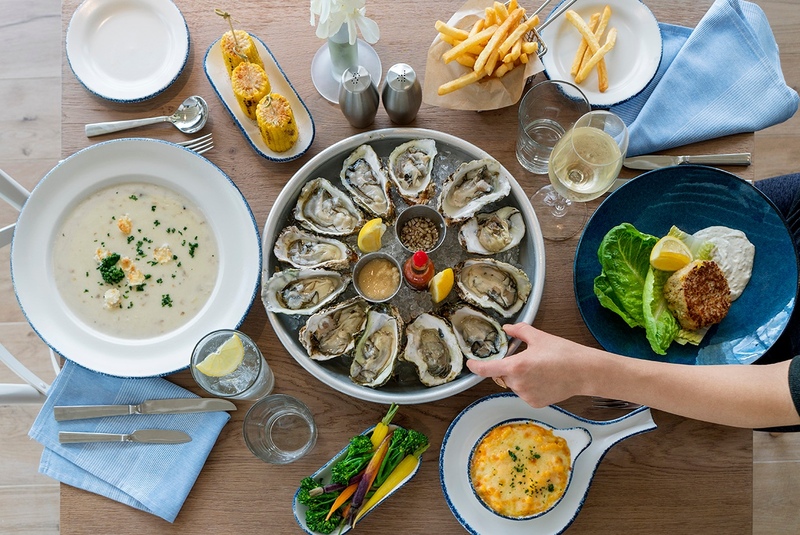 The New England-style seafood lunch and dinner spot features a robust raw bar where you can grab a seat and watch your oysters get freshly shucked. Also on the coastal menu are favorites like lobster, crab and a mouthwatering fish sandwich. Another new spot on board is El Loco Fresh with Mexican street fare; a perfect place when you’re on the go and craving fresh tacos, burritos and made-from-scratch mole sauce and tangy salsa verde . If sweets are your jam, the new Sugar Beach will play your tune. Appropriately near the classic hand-carved carousel on the reimagined Boardwalk neighborhood, this candy shop with colorful walls adorned by more than 200 types of candies has a variety of ice cream flavors and more than 20 toppings to satisfy any craving. There are cupcake decorating classes, too. Finally, the whole family can get together at Playmakers Sports Bar & Arcade, another exciting venue added to the Boardwalk. Playmakers is the place to be to watch the big game, showing everything from Premier League Soccer to the NCAA Championship on 31 big-screen TVs. From day to late night, enjoy craft brews and classic bar bites, like burgers, popcorn shrimp and wings. You can also feed your own competitive streak with Skee-Ball and air hockey or Ms. Pac-Man and Star Wars arcade games. Entertainment on board Symphony is turning up the volume as well. 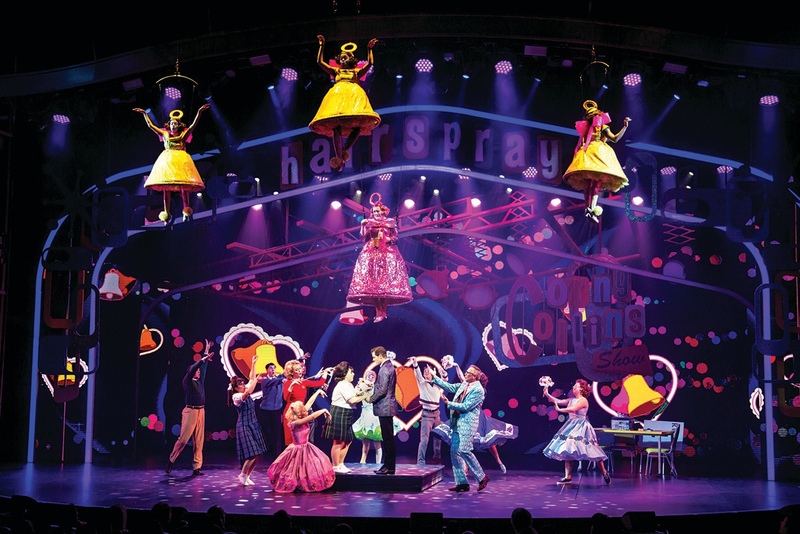 The Tony Award-winning musical “Hairspray” makes a triumphant return to Royal Caribbean – bigger and better than ever, along with a new Royal Caribbean original, “Flight: Dare to Dream,” which is a thrilling journey through time chronicling humanity’s fascination with flying. High-diving acrobatics also join the lineup with “HiRo” in the open-air AquaTheater, and the ice-skating stunts of “1977” in Studio B will take guests to London for a time-traveling adventure to solve the heist of the century. For even more interactive action, Studio B transforms into a thrilling glow-in-the-dark laser tag arena called Battle for Planet Z. Two teams go head to head to battle over the last planet in the galaxy. Looking for a different type of challenge? Another way for guests to team up is at Escape The Rubicon, where friends—old and new—must come together and race against the clock to crack a challenging mystery and escape the S.S. Rubicon before time runs out. Along with a lineup of new hits, Symphony touts signature Royal Caribbean experiences—a few with new twists. For example, a guest-favorite, the Ultimate Abyss, will let you ride the tallest, most thrilling slide at sea standing 10 stories high. There are two FlowRiders, our much-loved surf simulator, so adventure seekers can catch a wave or watch for wipeouts; as well the Perfect Storm trio of waterslides and the popular rock-climbing walls. Well-known specialty restaurants from across our fleet are on board too. The popular Jamie’s Italian, hibachi excitement at Izumi and the whimsical food and drink concoctions at Wonderland, are just a few of those part of the 23 specialty and complimentary dining options. 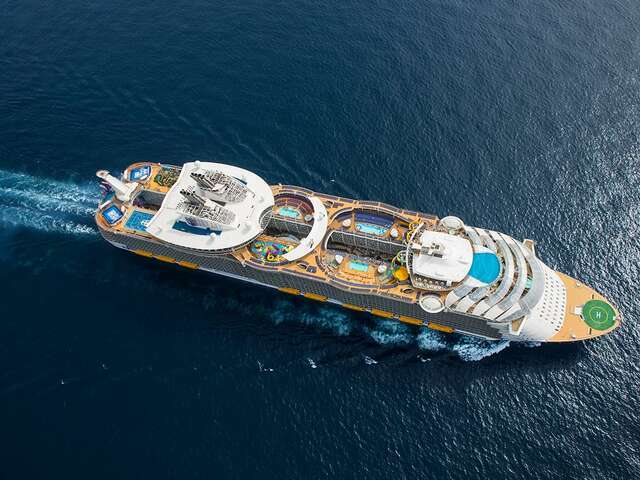 Contact us today to book this newest ship and experience the ultimate cruise vacation!